My 49th birthday recently passed. My wife hit the half century a couple days after me (yeah - she robbed the cradle). They say everything starts going downhill at 50. If that's the case, I think I hit 50 back in the early 90's. Thank goodness cardboard still holds up for many years. However, with all I have done over the past month, at this blog, at home, with family, at APTBNL, I am not sure if my forgetfulness is age or just stupidity. Case in point are these cards from Mark at Battlin' Bucs. I know we have traded. I know I sent him cards. I just don't remember if I posted those cards, and these are new cards from the goodness of his heart. Or am I that forgetful. Another "perk" of age is laziness. Sure, I could go through past posts and find my answer, but I don't feel like it. And that's crankiness. More aging. So before I yell at you damn whipper-snappers to get the hell off my lawn, let's check out the goodness from Mark. Sox. And bunting. And bunting Sox!!! I bet Nick is salivating over that pitcher at the plate. Then again, he probably has 11 of them. Lee is sporting my favorite White Sox throwback. They can bring that back anytime. Turns at two as well. Guess which Pirate double play between Wilkerson and Womack is from a spring training game. 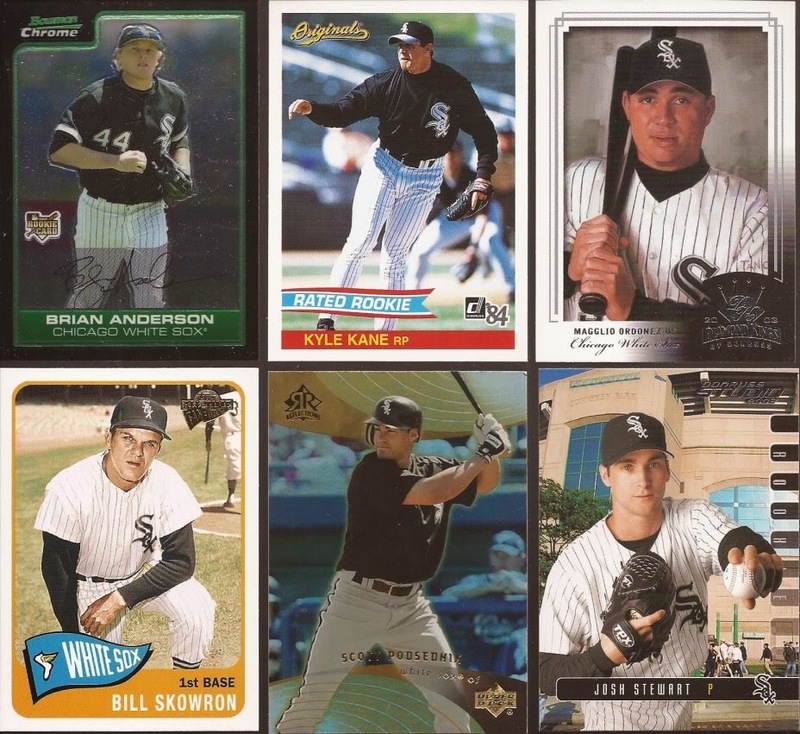 I nice haul of ChiSox too. Many were from years I was sorely lacking in cardboard, so Mark took away some space in my monster box. And I'm okay with that. 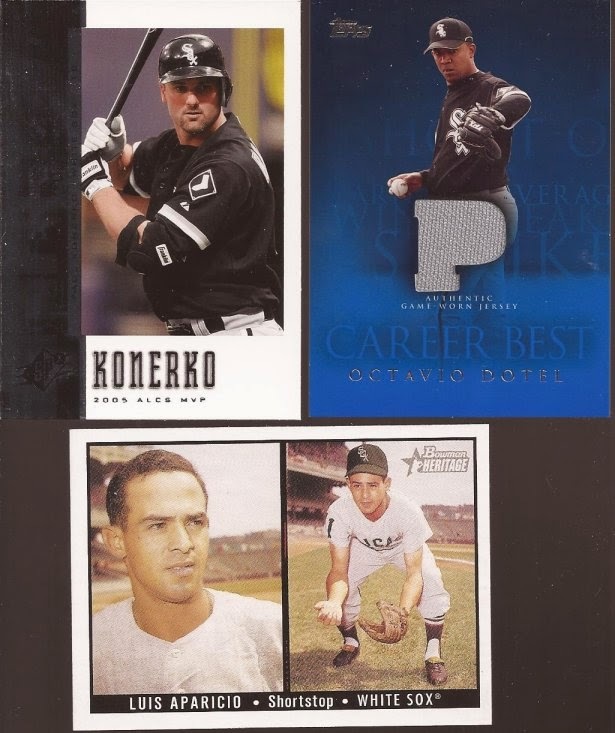 My Konerko collection grows almost daily now. The Lil' Luis goes with my Aparicio Project. And a White Sox relic? Why yes, I will accept that. Favorite card in the envelope was this beauty. Sure. It's vintage. It's a double play. What it is, though, is a wake up. If you visit the awesome Card Junk, you cannot miss this card. It's the background. But in the couple plus years of this blog, I have visited Card Junk a few hundred times but never really looked at this image. When I saw it, I thought "hey - now I have that card from that blog". It was a few more seconds before my brain goes "Oh - it's a double play. I never noticed that before". Growing old is a terrible, terrible thing. Wow, a Brian Anderson sighting. Haven't thought about that guy in years. 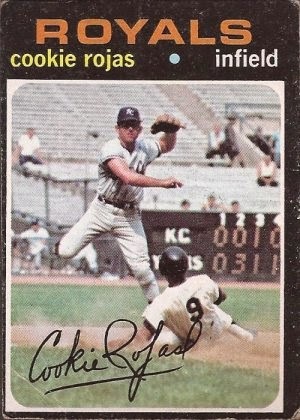 That Rojas is one of the best double dip cards ever made. P. S. -- Happy belated birthday! You don't look a day over the age of the internet! Thanks for posting the link to Battlin' Bucs; I didn't have that one in my reader list yet. Finding new blogs is my favorite part of trade posts. I like the simple design of that Dotel relic too. Thanks for finding me! It's always nice to pick up new readers. I don't remember either, and I can't use the age excuse! Just consider it payback for all those PWE bombs you've dropped on me. I don't think there's a good acronym for Tan-colored Bubble Mailers. Glad you enjoyed the cards, though. If you're lacking in early 00's Sox cards, I should be able to fill up a lot more space in those boxes. I already have some stuff set aside for you for my next round of "I don't remember why I sent this" packages.